From Glassmen's Web site: The Glassmen have moved their administrative offices just southwest of Toledo, Ohio, to a downtown location in the historic city of Maumee, Ohio. Recently named an "All American City," Maumee has spent decades following the progress of the corps - after all, Maumee was where it all began. The Maumee Suns, founded in 1961, developed into the Glassmen of today. 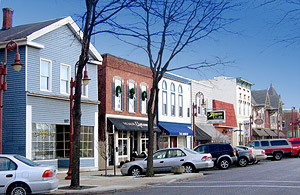 The new Glassmen office (far left) on historic Wayne Street in Maumee, Ohio. The new Glassmen office is located in a building that is part of the Maumee Uptown Historic District, and is listed as part of the National Register of Historic Places. Nestled in the midst of downtown businesses, shops and boutiques, the prime storefront location gives the public greater access to the corps and staff, and increases the visibility of the corps and its Entertrainment arts programs in the area. Read more on www.glassmen.org.